I’m always on the lookout for good recipes; sometimes I collect what I call “Recipe Pictures” – they’re self-explanatory, really. Unfortunately, the internet being what it is, I often have no way of knowing who the original creators are. 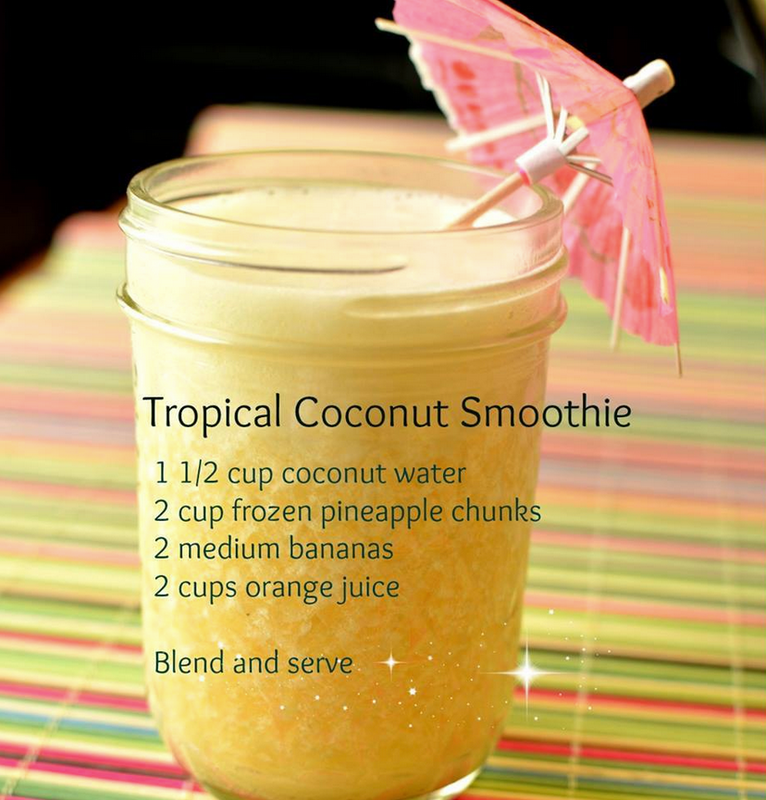 But here’s a recipe that is cool and refreshing, and as adjustable as you like! The young woman living with us at the moment has made these twice in the last week, they’re so good! They are filling, nutritious, and oh-so-simple to make! The roasted nut aroma that comes out of the oven is torment until they’re done – just don’t burn your mouth for impatience. 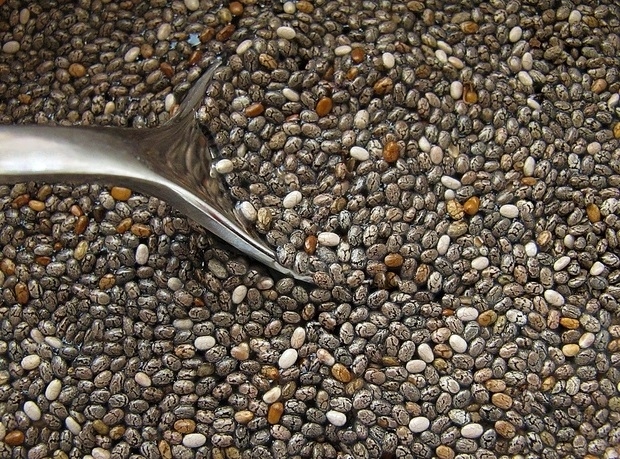 For those of you unfamiliar with Chia seeds, click on the link to find out more (likewise below for Buckwheat, which isn’t a wheat despite its name) – they are a powerhouse of goodness. Preheat oven to 160°C (325°F) and line a baking pan with parchment paper. Set aside. In a blender, grind the rolled oats and buckwheat grains until you have a fine flour. Add the rest of the dry ingredients into a large bowl and mix well, then stir in the water until combined. The mixture will be very liquidy at first but it will thicken up fairly quickly. Scoop it into the pan and spread it out with a spatula as evenly as possible, then cover it with a piece of baking paper and roll it flat in the pan. If needed, lightly moisten your hands and press it smooth to the edge. Sprinkle the bread with fine salt before going into the oven. Bake for about 25 minutes, or until firm to the touch. Let cool in the pan for 5 minutes and then lift it out and transfer it to a cooling rack for another 5-10 minutes. This is especially nice straight out of the oven – the nutty fragrance is amazing! Eat within 2 or 3 days – if you keep it longer it may just get a bit gummy, though it’s still good. Freeze it if you want it to keep longer, or store in an airtight container in the fridge. You can slice it before freezing, and then pop it into the toaster to warm / toast it. Over the years I’ve collected tips, tricks and lists of foods for quick ideas. Here is a sampling of types, tips and tricks for appetizers. Enjoy, and have fun exploring! ANTIPASTO, ANTIPASTI, OR ANTIPASTA? The Italian word is “antipasto” & literally means “before the food” (“pasto” comes from the Latin “pastus,” the past participle of the verb “pascere,” to feed). “Antipasti” is the plural of antipasto, & “antipasta” is just plain wrong. 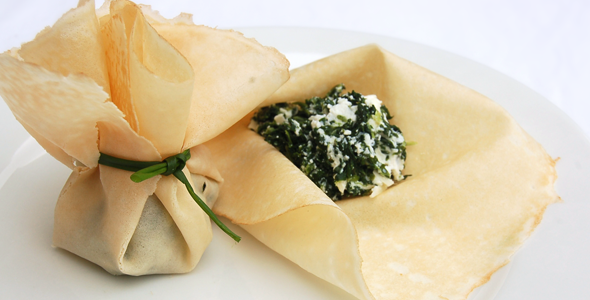 BEGGAR’S PURSE: A beggar’s purse is an appetizer composed of a crepe topped with a savoury filling & tied with thin strips of chives. The visual effect resembles a little purse. DIM SUM: Dim Sum means little heart or touch your heart. This Cantonese cuisine, which dates back to the 10th century AD, usually consists of small dishes, served in tiers of bamboo steamers or small to medium-sized plates, & varieties include savoury pastries, dumplings, filled buns, noodles, sweet pastries, vegetables, meats, crisp croquettes, sticky cakes, & fried rice. Families, friends, & co-workers alike all gather for this very social meal. HORS D’OEUVRE: Simply an appetizer before a meal, hors d’oeuvre (pronounced “or duhrv”) is French in origin. Comprised of “hors” which means outside, “de” meaning of, & “oeuvre” meaning (the main) work, it means a dish outside of the main course. Customarily served with cocktails, they are usually one – or two – bite size & can be cold or hot. The purpose of the hors d’oeuvre is to whet the appetite; if there is a long waiting period between when the guests arrive & when the meal is served, for example, during a cocktail hour. Antipasto is the Italian word for hors d’oeuvre, literally meaning “before the meal.” In Italian cuisine, this typically consists of cold foods such as cheeses & raw or marinated vegetables, as well as meats, especially cured meats such as prosciutto & sometimes salads. RUMAKI HORS D’OEUVRE: Combine a piece of chicken liver that’s been marinated in soy sauce, garlic, & ginger, with a water chestnut slice & a strip of bacon; skewer it together with a toothpick, & grill or broil it till the chicken liver is cooked & the bacon is crisp. SAMOSA: Have you ever eaten samosa? Do you know what they are? Samosa (pronounce it sah–MOH–sah) are deep–fried East Indian snacks (I‘ve also seen them as appetizers on the menu of one or two restaurants). A triangular piece of pastry is wrapped around a filling of meat and/or veggies, & frequently these delicious goodies are served with a dipping sauce. TAPAS: A “tapa” is a small meal or snack eaten between main meals. Its origin is credited two ways beginning in Spain. Spanish king Alfonso the 10th, the Wise, was ill & had to take small bites of food with some wine between meals. He then ordered all inns to serve food with wine. The small meals were welcomed by farmers & union workers, which allowed them to continue working until it was time for the main meal. The other story claims that tapas began in Andalusia, the home of sherry. Customers & travellers were given pieces of bread to cover the glasses. “Tapa” means lid or cover. This led to innkeepers adding ham, sausage, seafood, or cheese to the bread. Tapas have evolved into an array of dishes, which are eaten at all times of the day & night. SAVORY BISCUITS: One thing you could do way in advance are tiny savoury biscuits (especially nice with a little cheddar, poppy or sesame seed or a fresh herb worked into the dough). Cut them into shapes with canapé cutters (or small cookie cutters), bake & freeze. When you’re ready to serve, thaw, warm just a bit & split & serve with … slivers of ham & Dijon, a really nice cheddar with chutney, brie, smoked turkey & havarti, a hint of onion & smoked salmon…whatever you like. BACON/PINEAPPLE BITS: Wrap pineapple chunks with bacon, Broil. Serve with Chinese Mustard. CHERRY TOMATOES WITH PATE: Hollow out cherry tomatoes & fill with your favourite pate. CHICKEN OR SEAFOOD SALAD: A good hors d’oeuvres is to take wonton wrappers ( or egg roll wrappers cut in ¼’s). Spray mini muffin tins with cooking spray, push one wrapper down into well leaving corners hang over top, spray again & then bake at 350°F (180°C) until crisp & lightly brown (I think about 15 minutes – watch the first batch to see how long it takes as I can’t remember). Remove from pans and cook on wire racks. After cooling these can be stored in covered containers until ready to fill. Fill with chicken or seafood salad. They hold about 1 Tbs. As these can be made ahead & quickly filled they are good to serve. Also are filling. TART SHELLS: Go buy those little tart shells in the freezer section & buy a brie cheese & a jar of Major Gray Chutney. Put a small amount of chutney in the bottom of a shell & then a small chunk of brie & bake them off. Makes great finger food & very tasty. Cut the rind off the brie. HEARTS OF PALM WITH SMOKED SALMON: Roll a slice of lox around one piece of canned hearts of palm – slice into ¾ inch slices. When I ran out of smoke salmon I used prosciutto. The salmon wrapped pieces went quickly. QUICK & EASY KIELBASA: Cut kielbasa into bite size pieces. Spread in oven-proof baking dish. Cover with whole cranberry sauce, sprinkle with brown sugar. Bake till hot & sort of crispy on top, 350°F (180°C) for 20-30 minutes. TORTILLA WRAP: I take softened cream cheese & add things like diced ham and crushed pineapple, or diced ham, finely chopped green onions, garlic powder & dill, or dried beef, red onion, & garlic powder. Whatever you add, you mix well with the cream cheese. Then I spread the mixture on large tortilla shells & roll up. Then I put them in a long pan or on a platter & wrap up and put in the refrigerator overnight so they will firm up some. The next day I take & cut them into about 1″ slices & they have a pinwheel effect. They aren’t difficult & are pretty popular. What you add to the softened cream cheese is really up to your imagination, & budget. SMOKED SAUSAGES: Heat up some Lit’l Smokies & serve with a dip made by blending & heating equal parts red currant jelly & yellow mustard. These will disappear so fast you won’t know what hit you. CRACKERS: Almost anything served on a cracker, dips, spreads, etc., taste just as good on a slice of cucumber, assuming you like cucumbers. HEART OF PALM: An elegant appetizer is hearts of palm, cut into 1-inch slices, with strips of nova salmon or lox wrapped around, & speared with a toothpick. A little chopped fresh parsley, dill or chives sprinkled on top is attractive. Serve with a side dish of mayonnaise mixed with capers & drops of lemon juice to taste. HAM ROLLS: Mix softened cream cheese with horseradish & Worcestershire to taste. Spread on boiled or deli style sliced ham, roll up, chill & slice into bite size pieces. I do the same with a dill pickle. I also spread salami with a good mustard, add a piece of cheese & repeat as above. My husband likes a piece of lettuce rolled up in these too. Since they go pretty quick, the lettuce doesn’t get limp. I have used various luncheon meats with various fillings & they have all been hits. You can use your own ideas to roll up. I never have anything left. POTATO CHIP CRISPER: Before serving potato chips alongside the rest of the dinner, warm them up in the oven at 200 degrees for five minutes in the bowl you will serve them in. This brings out their flavour and makes them crisp again. Each of these combinations can be served with crackers, thin–sliced toast or chips. QUICK WEDGES: Make sure to have unusual chutneys or jellies on hand to pour over a square of cream cheese or a wedge of Cheddar then serve with crackers. RELISH TRAY TIP: Marinate celery , carrot & cucumber sticks & onion slices in Italian dressing for a relish tray.